Wasn't sure where to put this, but here's a linear diagram of building heights in Adelaide. That's very nice - did you do that? Brilliant work madelaide. I see similar things for other cities on Skyscrapercity, so it's nice to see one for Adelaide. Only things I'm not sure on are Sofitel's height, which got mysteriously bumped up to 115m a while back on this site even though I think it's still 111m (I could be wrong), and Synergy Construct have said that 115 KWS is 92.8m tall. 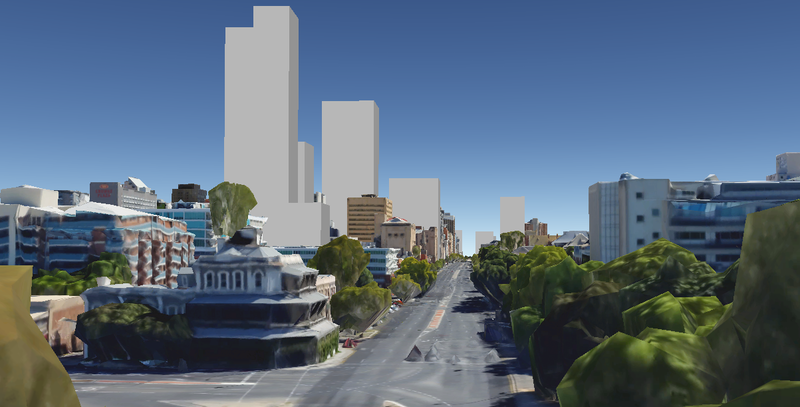 The Adelaidean may need an update soon as well, as we think it's gained a 37th level judging by the newest renders. Fantastic work in any case. madelaide wrote: Wasn't sure where to put this, but here's a linear diagram of building heights in Adelaide. Even if only half of these get built over the next 4-5 years, it shows what a big impact on th skyline these developments will make. Want to add my voice to the general thanks for the images you're posting Slenderman, looks great! I was wondering if there might be the possibility of zooming the camera almost down to street level to take some shots of selected streetscapes where the proposals have high impact? shiftaling wrote: Want to add my voice to the general thanks for the images you're posting Slenderman, looks great! I was wondering if there might be the possibility of zooming the camera almost down to street level to take some shots of selected streetscapes where the proposals have high impact? No problems. I've typically avoided doing street level pictures because you get lots of trees in the way, which look really blocky in Google Earth. But I can definitely get some new angles from street level if you'd like. Are there any particular locations you want? I don't know about others' thoughts but I'm interested to see the view looking westward down North Terrace with the two "new tallest" possibly making an impact! Here you go. As you can see, Google Earth is quite ugly at street level. There's random grey blobs in the street (possibly cars), the trees are horribly blocky and the textures of low rise buildings aren't very nice. That aside, obviously the Adelaidean will dominate from here, Realm also has a large impact, and even the Urbanest will have a reasonable impact (whether or not that's a good thing I'll leave for you to decide). Then there's the Riverbank Office Tower, the Uni buildings and 1-8 North Terrace in the distance. Had a quick look around at other areas at street level, but was quite underwhelmed to be honest. Some new interesting views might pop up in Whitmore Square, with 1-8 North Terrace, West Franklin, Central Adelaide, Vision (both complete now), the Light Square hotel, Alto, U2 and the Sofitel directly behind U2, not to mention Bohem to the immediate right of this shot. Let me know if you want more, but I think this works better from the air personally. Wow! Pretty major visual impact, now just to hope they look nice! Llessur2002 wrote: That's very nice - did you do that? Thanks Llessur2002. Yeah, I put this together after admiring slenderman's contributions. Hoping to show as much commitment as he does to updating in the future. slenderman wrote: Brilliant work madelaide. I see similar things for other cities on Skyscrapercity, so it's nice to see one for Adelaide. Thank you slenderman. Your suggestions have now been updated. I'll try to keep up with you as new proposals are announced and constructions commence, till the skyline is complete! Woo big bad boy Dominator 1 I like the design you chose. I posted these to SkyscraperCity a few weeks ago, but I thought I might post them here. For those of you who haven't seen my post in the Pub, I made a new 3D model of Adelaide and colour-coded each 35m+ building corresponding to the decade in which they were built (Red = Pre-1960s, Pink = 1960s, Orange = 1970s, Yellow = 1980s, Green = 1990s, Blue = 2000s, Purple = 2010s, Slate Grey = U/C). But that picture didn't include the proposed developments (Cyan), which I have decided to include now. 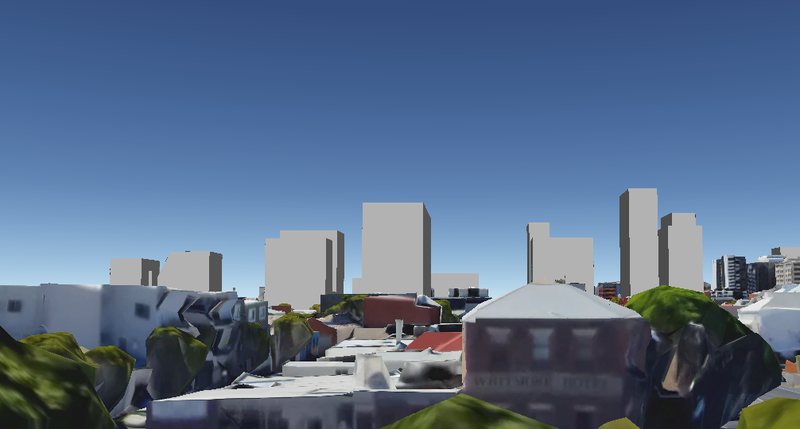 The reason for this is that I need to update Sketchup to the newest version to be able to add models to Google Earth, but I think the newest version is no longer free beyond a 30 day trial. I might look into this a bit further, but we may have seen the last of the Google Earth pictures, unfortunately. As these pictures are only a few weeks old, the only difference not reflected in these pictures is that I slightly altered the 164-180 Hindley Street proposal in line with what that render shows. Remember that the map I'm using only contains the square mile, so there are no Medical Precinct/Riverbank/University buildings such as the InterContinental or Riverbank Office Tower. There is also no DOMINATOR 1 yet, as the location/height have not been revealed yet, and some projects that have had no updates for about 12-18 months have also been omitted, notably the Park Hotel. If we get some updates, I'll put them back in. Great work slenderman. The variety of elevations in your images give a real sense of spread as the skyline takes to all edges of the square mile. Looking forward to some more of those Cyans turning Grey soon!